I can still remember the first time I saw a Rodney Mullen freestyle skate video, I was 18 at the time and was instantly hooked. 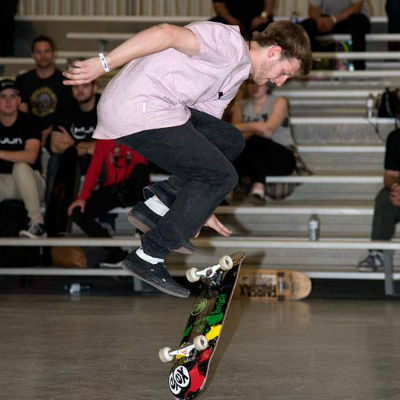 Ever since then freestyle skateboarding has been a huge part of my life, learning new intense tricks, meeting awesome people from around the world and just having fun! Currently I am attending college taking a three year course to become a Machinist. I am also very lucky that I have three great sponsors who support me in what I do (Extreme Official, 5Star and Rastaclat) When I am not skating I love snowboarding and drawing, I also love to travel and hang with my friends. In May I will be competing for the second time at the World Freestyle Round-Up hoping to place in the top ten this time. New TUS Contestant: Jordan Sterling!